The Marine Corps‘ top general is pleading with the Navy secretary to address several unplanned expenses — including missions along the southwest border and hurricane damage to major East Coast installations — that he says are posing “unacceptable risk” to combat readiness. Marine Commandant Gen. Robert Neller says his service is facing “rapidly accelerating risks,” according to a memo dated March 18 that was sent to Navy Secretary Richard Spencer. The memo, which wasfirst obtained and reported on by the LA Times, has been posted online. Military.com has confirmed its legitimacy. Neller details several exercises and training missions he said he’ll be forced to cancel or reduce as a result of the budgetary problems. They include pre-deployment training for an infantry battalion, two artillery batteries, a tank company and others; reduced maintenance funding for combat equipment; the cancellation or downsizing of several major exercises in Europe and the Asia-Pacific region; and the cancellation of Reserve mobilizations. “The overall impacts of these cancellations and expected cancellations will result in three extremely negative impacts to the joint forces,” Neller said. Fallout, he added, includes degraded combat readiness, money problems and bad messaging to allies and potential partners. “Marines will not participate in exercises in Indonesia, Scotland and Mongolia and will reduce participation in exercises with Australia and the Republic of Korea at a time where we are attempting to double down on strengthening alliances and attracting new partners,” the memo states. A second memo, dated Feb. 19, shows Neller asked acting Defense Secretary Patrick Shanahan for his support in funding hurricane repairs to several North Carolina Marine Corps bases after hurricanes Florence and Michael left significant damages to housing, training areas, railways and other infrastructure. 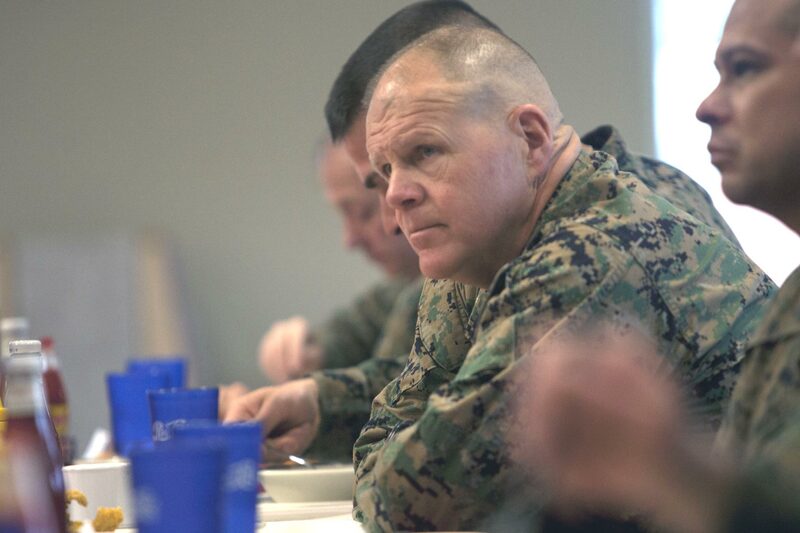 The damage, Neller wrote, would cost $3.5 billion, and the Marine Corps could no longer self-fund recovery efforts. Aside from the storm damage and unplanned border-security missions, several other surprise expenses are posing security risks, according to the memos, including boosts to the size of a Marine rotation in Australia, civilian raises and adjustments to privatized housing allowances. A spokesman for Spencer’s office confirmed the Navy secretary had received the memos, but said they had no public comments about a response at this time. In his memo from this week, Neller asked for Spencer’s help in pushing Congress to fund hurricane recovery efforts. Canceling training and international exercises only harms Marines, he said. “Marines rely on the hard, realistic training provided by these events to develop the individual and collective skills necessary to prepare for high-end combat, while simultaneously building the experience and leadership of the [noncommissioned officers], [staff] NCOs and junior officers who will lead our Marines into harm’s way,” Neller said. “Although some effects can be mitigated, the experience lost by these units at a critical time in their preparation cannot be recouped,” he added. When Neller was asked at the annual McAleese Defense Programs Conference in Washington, D.C., last week what extra funding he would request from Congress, he said it’d be money to fix the damage to Marine bases in North Carolina and Georgia. The hurricanes didn’t cause the damage that you see from the outside of the building, he said. But as the hurricanes hovered over the bases, dumping several feet of water on the installations for days, their destruction was significant, he added. — Gina Harkins can be reached at gina.harkins@military.com. Follow her on Twitter@ginaaharkins. Excellent content provided by Military.com Legally licensed through the NewsCred publisher network. Please direct all licensing questions to legal@newscred.com.